Did you see it Small Flower? It was there my Lady, I know it was! It ran from the corner! (Hinagata wakana no hatsu moyô: Kanaya uchi Ukifune), ca. 1770s. 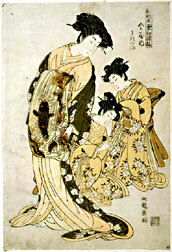 Color woodblock print, ôban, 15 in. x 10 in.